Yesterday I was feeling antsy about the kids and their illness. I’ve been a mom for just over eight years and I have five kids. That’s not forever but I feel like I have seen my fair share of illness and have a pretty good handle on what is normal and what is not. I’m an excellent “we’ll ride this out” mom. Years of experience have taught me that most issues will work themselves out with enough time, a little pain or fever relief if needed, and plenty of warm baths and stories on my lap. Today will mark four weeks of this mystery illness and things were just not settling well in my mama heart. I prayed and prayed yesterday morning that I would have peace in this trial or that I would do something to change it. I called our physician that morning and she reassured me again that she just thought it was viral. This didn’t settle well. I’ve been riding this virus out for so very long. I started doing my own research again, and then I got a call from the school to come and pick up Henry (he got the bug first and is the only one recovered enough to go to school) because he threw up. You guys. He puked at school. I went to get him and came home and just cried. I didn’t feel like I had it in me to cycle through a stomach bug too. A funny thing happened though while I was at the school. I took Paul with me and when I walked into the office a mom there asked if he had impetigo. I had just texted my sister saying that I thought they might have impetigo but I didn’t know. I was debating about driving an hour and a half (one way!) over the mountain with sick kids to get a second opinion. The mom in the office was the tipping point. She was answering my prayers and I knew it right when she said it. I took Henry home and started making phone calls right away. I miraculously got an appointment for later that afternoon with a pediatrician and so we went. We had such a weird list of symptoms that he said he thought we had started out with a virus and then got the impetigo, which is a staph infection on their faces, it looks as bad as it sounds. No wonder I didn’t know what was going on, it was too many things all at once. He gave me a prescription for some fancy cream that is supposed to get rid of the impetigo. He said Kimball was one of the worse cases he’s seen. The virus is gone, we haven’t had fevers or sore throats for at least a week, but now I know what we are dealing with! Thank goodness! Now I get to medicate 4 kids, 3 times a day, for 10 days. Wish me luck. 🙂 More great news is that the baby hasn’t gotten it. I’ve been so nervous for him because he’s just so little still. I think we are going to make it, friends, and there’s a light at the end of this tunnel. My mind has peace and my heart has hope. Thank you for all of your kind words and prayers. They mean so much to me. Today I’m sharing a really simple but very addicting recipe with you. Maple candied pecans! I saw this recipe from Emily at One Lovely Life and I’ve been drooling over it ever since. You can’t get any easier than mixing together pecans and pure maple syrup and letting them slowly cook down together, bubbling and popping along the way, until you end up with perfect candied nuts that are naturally sweet. Your house will smell amazing and you’ll be picking them up hot to pop in your mouth as soon as you can. I just love candied nuts and feel like they are the perfect fall and winter treat. 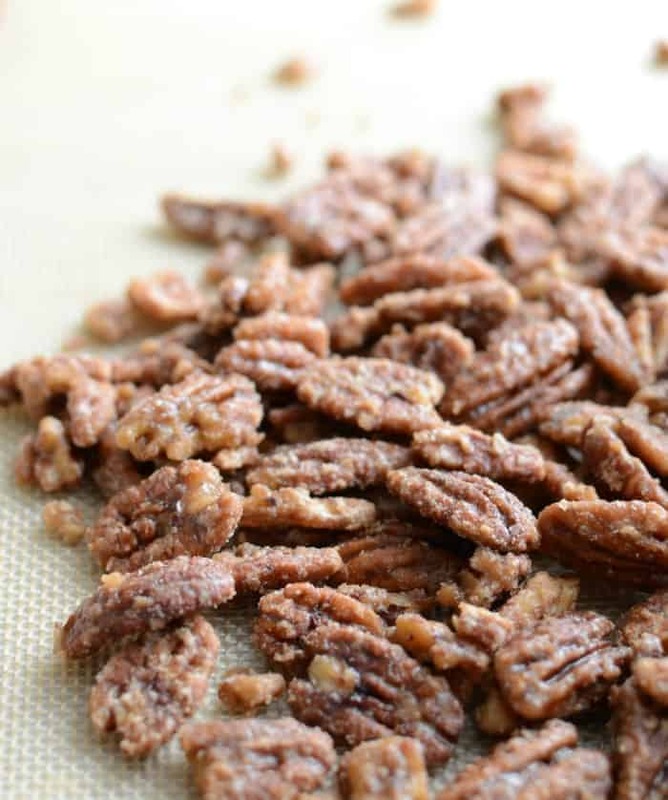 You’ll love how simple these maple candied pecans are to make. In a heavy bottomed skillet or pan, heat the pecans and maple syrup over low to medium-low heat, stirring continuously. The maple syrup will start to bubble and you’ll see the extra moisture evaporating. Keep cooking and stirring until all of the extra moisture has evaporated and the maple sure starts to crystallize and stick to the nuts. This should take 5-8 minutes. Make sure you stir the whole time so that you don’t burn the nuts. When the moisture is all gone turn the nuts out onto a baking mat or a piece of parchment (or waxed) paper and let the nuts cool. Enjoy just as they are or add to your favorite salads, trail mix, granola, popcorn, or dessert. I used a cast iron skillet to make these maple candied pecans. You’ll want to use one too or a heavy bottomed pan of your own. A nice thick pan will distribute the heat well and help your nuts to candy and cook evenly without burning. Cooking the nuts slow and low doesn’t mean it takes a long time, only about 7 minutes total, but don’t forget to stir. Burning two cups of nuts would be something to cry over. These are perfect to throw on top of your favorite salads, to eat plain, and to add to oatmeal or your favorite popcorn recipe. 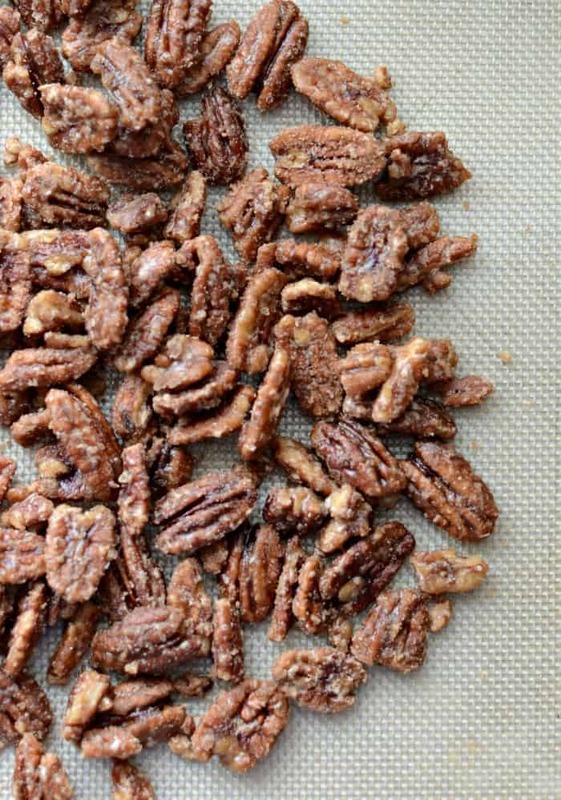 Just be warned, once you start eating these maple candied pecans, it’s hard to walk away. Enjoy, friends, and thank you for walking with me on this hard road of motherhood and child rearing. We’re doing hard things. Together we can do so many more hard things. It is so hard to see my kids get sick. I’m so sorry to hear that your kids have been sick for so long! Praise God that someone was there to mention what it might be. I hope all goes well and they are all better really soon. The recipe looks amazing and I will have to try it. Thank you for your kind words Amy! I hope you try that recipe, it’s an easy one that I’ve been making over and over again! Hang in there…. hope all the kids are feeling better. Oh Melissa, that sounds like a nightmare! I’m so sorry!! Sending healing vibes your way!! And these nuts look divine. I’ll definitely try them out! Thank goodness you finally have answers! I hate to admit it but one reason I worried about having more kids was always being worried they would get sick so small. I will never get the image of Garrett at the doctor’s office in this straight jacket thing (before he was 1) out my head…I think it scared me out of more kids. I can totally understand your break downs…you handle it better than I ever would! Did you call the pediatrician who gave the virus diagnosis? 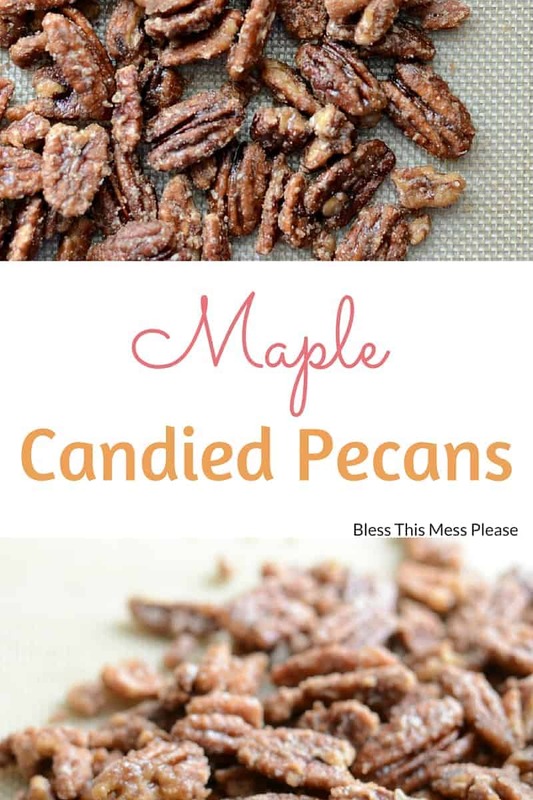 Now onto the pecans…I love pecans and must give this a try…like immediately! I’ll let you know how they turn out!? I love when you show up on my Google recipe searches! This was easy and delicious. Thank you! easy simple recipe…i added a little of vanilla…way better using a kettle pan than roasting in the oven. My syrup was a tiny bit stringy as they finished, but then they went a little dark and not crystalline. About 8 min. Was my medium electric heat too warm? Yep, the temp was just a little too hot for this. Did it still taste ok?